We are giving away 250 Closed-Beta invitations for Tactical Intervention aka Counter-Strike 2 to our loyal readers and fellow gamers. Tactical Intervention is one of inMotion Gaming’s most highly anticipated games of the year, so make sure you secure your spot for the CBT (Closed-Beta Testing) before 4pm (PST) on Wednesday, March 14! Tactical Intervention marks the much-anticipated return of Minh “Gooseman” Le, the creator of the iconic Counter-Strike. inMotion Gaming has 250 email invitation slots available! To secure your invitation please follow the instructions below. Our Tactical Intervention First Look Video is out! We have also included a bonus gameplay video, with a second extended gameplay video in the works, so if you haven’t seen it yet, click on the link above and check it out! Tell us you want an invite to the Tactical Intervention Closed-Beta and that you give us permission to pass your email address on to the game developer, MAYN Interactive. Make sure you enter the same email address in the email field as the one you used to create your account at OG Planet. Also make sure you enter your address correctly. Subscribe to our website, and follow us on Facebook or Twitter to keep up to date with our announcements. From the Creator of Counter-Strike! Your email address will not be made public, shared, rented or sold, however by submitting a comment below, you do give us express permission to communicate with you directly, and to pass your email address on to MAYN Interactive to facilitate your invitation to the CBT. Please do not enter your email address in the actual comment box, as this will make it publically accessible, and we can’t be held responsible in that case. All applications need to be in by 4pm (PST) on Wednesday, March 14. Invitations will be granted on a first come, first serve basis. Feel free to share this with your friends! The Tactical Intervention Closed Beta Key giveaway is now closed. Our apologies to those who didn’t make it, however we are trying to secure more slots if they become available. Any new slots will be announced in a new article, so subscribe to our RSS feed or email updates to ensure you don’t miss out. I would love to get a chance to play the closed beta of this game, it looks good. I give you permission to pass my email address on to MAYN Interactive. I want an invite to the Tactical Intervention Closed-Beta and I give you permission to pass my email address on to the game developer, MAYN Interactive. I want an invite to the Tactical Intervention Closed-Beta and I give you permission to pass my email address on to MAYN Interactive. Thanks, I appreciate it. I would like an invite to the Tactical Intervention Closed-Beta. I give you permission to pass my email address on to the game developer, MAYN Interactive. I really want an invitation. I give permission to send my email address to the game developers. I would love an invite to the Tactical Intervention Closed-Beta and I give you permission to pass my e-mail address on to the game developer, MAYN Interactive. Thanks!! I want an invite to the Tactical Intervention Closed-Beta and I give you permission to send my email address to the developer, MAYN Interative. I’d love an invite to the Tactical Intervention Closed-Beta. I would appreciate an invitation to the Tactical Intervention Closed-Beta, and I give you permission to pass my email adress onto the game developer, MAYN Interactive. I want an invite to the Tactical Intervention Closed-Beta and I give you permission to pass my email address on to MAYN Interactive. I really want key for this game It will be cool to got it. I want an invite for this asome game and I give you permission to pass my email address on to the game developer, MAYN Interactive. I want an invite to the Tactical Intervention Closed-Beta and I give you permission to pass my email address on to MAYN Interactive. Please give me one. Thank you! I would like to enter the beta, and you have permission to send my email to the developer. Thank you. I want an invite to the Tactical Intervention Closed-Beta and I give you permission to pass my email address on to the developer. Hello! I would like an invite to the Tactical Intervention Closed-Beta. I also give my permission to pass my email address on to the game developer, MAYN Interactive. I have been a long time supporter of Valve and the Counter Strike series and would love to help improve it in any way I can! I would like to have a invite to the closed beta! and i give you permissions to pass my email! i want a invite to Tactical intervention Closed-Beta and i give you permision to pas my email address on to the game developer, MAYN Interactive. I want an invite to the Tactical Intervention Closed-Beta and give you permission to pass my email address on to the game developer, MAYN Interactive. i want a invite to Tactical intervention Closed-Beta and i give you permision to pass my email address on to the game developer, MAYN Interactive. I would definitely love to get in on some beta action for this game. I accept with the distribution of my email address to MAYN Interactive. I would like a invitation to the Tactical Intervention CB and i give you permission to pass my email address to the game developer, MAYN interactive. Played CS since beta 6.5 and would love to see what the original creators have come up now. I want this game now!!!!!! xD Would love to have fun with CS2 while i help to test. I give you permission to pass my email address on to MAYN Interactive. I would like to be a part of the Tactical Intervention Closed-Beta. I give you permission to pass my email address on to the game developer, MAYN Interactive. I really want an invite to the Tactical Intervention Closed-Beta and I give you permission to pass my email address on to the game developer, MAYN Interactive. I want an invite to the Tactical Intervention Closed-Beta and give permission to pass my email to MAYN Interactive. This game looks amazing and I really want to try it. I would love an invite to the Tactical Intervention Closed-Beta and I give you permission to pass my email address on to the game developer, MAYN Interactive. I would like an invite to the Tactical Intervention Closed-Beta and I give you permission to pass my email address on to the game developer, MAYN Interactive. Thanks alot! it would be awesome to get a closed beta invitation! I give you permission to pass my email address on to the game developer, MAYN Interactive. i want a closed beta invitation so i give you permission to pass on my email. Saw the gameplay video and it looks awesome, I’d love a chance at the beta. You have permission to pass my email to the developers. I’d really like to go in! I give you permission to pass my email off to Developer MAYN interactive. I want an invite to Tactical Intervention Closed-Beta as it looks like a lot of fun and i love to get to play it, you have my permission to pass my email address on to MAYN Interactive. i want a closed beta invite, so i give you permission to pass on my email. I want an invite to the Tactical Intervention Closed-Beta and I give you permission to pass my email address on to the game developer, MAYN Interactive. Thanks for this opportunity! Yes, definitely I would like an invitation if it`s possible.Would be freakin` awsome.I give You permission to pass my email address to the game`s developer, MAYN Interactive. I’d really like a key for Cs:GO beta, I give you my permission to pass my email address on to the game developer, MAYN Interactive. This isnt CS:GO its Tactical intervention two very different games! I want an invite to the Tactical Intervention Closed-Beta and I give you permission to pass my email address on to the game developer MAYN Interactive. I would love to get a chance to play the closed beta of this game, it looks good. I give you permission to pass my email address on to MAYN Interactive, the developper of the game. altho i do not give permission for sharing my email to any other 3th party company’s. I would like an invite to the Tactical Intervention Closed-Beta, I would also like to give you permission to pass on my E-mail details to the game developer, MAYN Interactive. I’d love an invite to the Tactical Intervention Closed-Beta and i give you permission to pass my email on to the game developer, MAYN Interactive. I give you permission to pass my email address on to the game developer, MAYN Interactive. I really want an invitation to the Tactical Intervention Closed-Beta. I also give you my permission to pass my email address on to the game developer, MAYN Interactive! I would love the opportunity to help you out and test the game. Thank you for taking the time to read this short message. I would like an invite to the Tactical Intervention Closed-Beta, and I give you permission to pass my email address to MAYN Interactive. I want an invite to the Tactical Intervention Closed-Beta. I give you permission to pass my email address on to the game developer, MAYN Interactive. Hi! I would love to get an invite to the Tactical Intervention Closed-Beta and i give my permission to pass my email address on to the game developer, MAYN Interactive. Hey, it would be nice to test your game. Take my email and give it to MAYN! Thanks for this chane guys. I would love a pass, i consent to my email being sent to MAYN interactive. hello! I want an invite to the Tactical Intervention Closed-Beta and I give you permission to pass my email address on to the game developer, MAYN Interactive. Hello! I would like an invite to the Tactical Intervention Closed-Beta. I also give my permission to pass my email address (chrisalex77@att.net) on to the game developer, MAYN Interactive. This game looks cool and i’d like to preticipate in it’s beta. I would like a pass to the Tactical Intervention Closed-Beta and that i give you permission to pass your email address on to the game developer, MAYN Interactive. I would like an invite to the Tactical Intervention Closed-Beta and I give you permission to pass my email address on to the game developer, MAYN Interactive. I would like an invite to the Tactical Intervention Closed-Beta. I give you my permission to pass my email address on to the game developer, MAYN Interactive. id like an invite to Tactical Intervention closed-beta. I give you my permission to pass on my email-adress to game dev. MAYN interactive. I want an invite to the Tactical Intervention Closed-Beta and that you give us permission to pass your email address on to the game developer, MAYN Interactive. I’d love to get into the Tactical Intervention beta. I’m fine with the distribution of my email address to MAYN Interactive. I would like to get into the Tactical Intervention beta. I give you my permission to pass on the my e-mail to MAYN Interactive. i would love a chance to try out this game. I’d like to try out Tactical, and permit you to pass my email along to MAYN. Chris, we most definitely can’t wait for you to review Tactical Intervention for us either! For those of you who don’t know or missed it… Chris wrote a brilliant review of Mass Effect 3. If you haven’t read it yet, you definitely should! If you like it, help us get the word out by clicking the “like” and +1 buttons, or sharing it on Facebook, Twitter or Google +. And while you’re over there, if you’ve played the game already, give it your own rating out of 5. We appreciate all your comments, and are pleased to inform you that everyone who posted a comment here so far, IS getting an invite to the Closed-Beta for Tactical Intervention (as long as you entered your email address correctly, that is). We still have 112 invites to give away before 04:00pm (PST), so tell your friends and followers, and help us get the word out! The CBT doesn’t start until Thursday! Just a few more hours! I would love an invite to the Closed-Beta of Tactical Intervention and I give you permission to pass my email address on to the game developer, MAYN interactive. I would love to have an invite to the Closed-Beta of Tactical Intervention and I give you permission to pass my email address on to the game developer, MAYN interactive. I would love for a chance to play with you guys. I would like a chance to play the beta!! I would like an invite to the Tactical Intervention Closed-Beta and I give you permission to pass my email address on to MAYN Interactive. Thanks for the opportunity. I would like an invite to the Tactical Intervention Closed-Beta and that you give us permission to pass your email address on to the game developer, MAYN Interactive. I would like to participate in the beta, and I give permission for my email address to be passed on to MYAN – Looknig forward to it! Beta key please! I give permission for you to pass my email on to MAYN Interactive for the TI beta. I would like a closed-beta invite so I may promote the game as well as In Motion Gaming with my video updates! I give you permission to spread my email to MAYN Interactive as well. You have permission to pass my email onto mayn interactive! I want into the beta please!! I would very much like a Tactical Intervention Closed Beta invite. You have my permission to pass my email address on to MAYN Interactive. I want an invite to the Tactical Intervention Closed-Beta, and I give us permission to pass my email address on to the game developer, MAYN Interactive. i give you promission to email me and i would love to test the beta! I would very much enjoy being part of the Tactical Intervention closed beta, and I give you permission to pass my email address to MAYN Interactive. Thank you! I would love an invite to the beta. I haven’t heard much from this game, and I really want to see if it has the potentail to even be compared to CS. Signed up, thanks. i want an invite to the Tactical Intervention Closed-Beta and that i give you permission to access my email address on to the game developer, MAYN Interactive. I have played Counter-Strike since 1.3 and would love an opportunity to play in this Closed-Beta. I grant you permission to pass my email on to MAYN Interactive for the TI Beta. Thank you. I do give permission to pass my email address on to MAYN Interactive to facilitate my invitation to the CBT. I am definitely interested in an invite to the Tactical Intervention Closed-Beta and give you permission to pass my email address on to the game developer, MAYN Interactive. Thanks. I want an invite to the Tactical Intervention Closed-Beta and that I give you permission to pass my email address on to the game developer, MAYN Interactive. New posts are appearing but mine still says waiting for confirmation.. Is that normal? I need to play this game!! I want an invite to the Tactical Intervention Closed-Beta, and I give you permission to pass my email address on to the game developer, MAYN Interactive. I would like an invite to the Tactical Intervention Closed-Beta. I give you permission to pass my email address dany080@net.hr on to the game developer, MAYN Interactive. I would like an invite to the Tactical Intervention Closed-Beta and grant permission for inmotiongaming to share my email information with MAYN Interactive. I would like an invite to the Tactical Intervention Closed-Beta and that I give you permission to pass my email address on to the game developer, MAYN Interactive. You have permission to pass my email on to MAYN for an invite to the closed beta. I want an invitation to Tactical Intervention!! I give permission for you to pass my email address to MAYN interactive! May i have an Invite to TI closed beta, please? I give you permission to send me emails. Thanks a bunch! I want to test this beta, please feel free to share my email addres whenever its neede. I want an invite to the Tactical Intervention Closed-Beta I give you permission to pass your email address on to the game developer, MAYN Interactive. I would love to help test tactical intervention. I would love an invite to the Tactical Intervention Closed beta and I grant permission to pass my email to the game developer MAYN interactive. i want an invite to Tactical Intervention Closed-Beta and i give you permission to pass my email address on to the game developer, MAYN Interactive. i give you permission to email me, and i would love to test the beta! I would like an invitation to the Tactical Intervention Closed-Beta and I here by give you permission to send my email address to MAYN Interactive. I would like to get an invite to the Tactical Intervention Closed-Beta and i give you the permission to pass my email address on to the game developer, MAYN Interactive. I want an invite to Tactical Intervention Closed-Beta (Counter Strike Global Offensive) i would like to get permission and get the game. I am a huge Counter Strike Fan and i would love to get Global Offensive to play. I have all the counter strike and i am waiting for Global Offensive. I would love an invite to the Tactical Intervention Closed-Beta, and I give you permission to pass my email address on to the game developer, MAYN Interactive. I would like an invite for for the Tactical Intervention closed beta. You have my permission to pass my e-mail address on to MAYN Interactive and no one else. I give you permission to pass my email. I also want to join the Tactical Intervention Closed Beta. Pass my email to MAYN for the TI Beta. Thank you! Could I please get an invite for the Tactical Intervention Closed-Beta? I give permission to pass my email address to the game developer MAYN. Thank you. I would love to have the chance to try out this new game. I give my permission for you to pass my email along to MAYN Interactive. I have actually never played counter strike before, but I would like an invite to this cool looking game’s beta. Thank you. I would love to be given a Beta Key, In fact it would make my year! I have no qualms with you giving my E-mail address to the developers (MAYN Interactive) I mean, how else would i get the key? want an invite to the Tactical Intervention Closed-Beta and I give you permission to pass my email address on to the game developer, MAYN Interactive. I give you permission to pass my email adress along to MAYN Interactive ,the developers of Tactical Interventrion so that i may partake in the Open Beta. PLEASE SEND ME AN INVITE!! I would like permission to play the Tactical Intervention Closed-Beta, and you have my permission to pass my email up to the game developer MAYN Interactive. I want an invite to the Tactical Intervention Closed-Beta and I give you permission to pass your email address on to the game developer, MAYN Interactive. I would like a pass and you could pass on the email. I would like a beta key and I give you permission to pass on my email. I would love to receive an invite to the Tactical Intervention Closed-Beta and I give you permission to pass my email address on to the game developer, MAYN Interactive. I would love an invite to the beta. I’m a big Counter-Strike fan, and would love to see if this game can even compare. Haven’t heard from it in a while. I give you full permission to pass my email on to MAYN Interactive for the TI Beta, thanks. you want an invite to the Tactical Intervention Closed-Beta and that you give us permission to pass your email address on to the game developer, MAYN Interactive. hey i would like an invite to the Tactical intervention Closed-Beta and i give you permission to pass my email address on to the game developer, MAYN interactive. I would like a beta key and I give you permission to pass your email address on to the game developer, MAYN Interactive. I would love a chance to be invited to this game’s Beta, CS has been one of my favorite and most played games for years! You may absolutely pass my email along to the developers. I would definitely like beta access to tactical intervention! you have my permission to refer my email to MAYN interactive! I would love an invite to the Tactical Intervention Closed-Beta and I give you permission to pass my email address on to the game developer, MAYN Interactive. THanks!!!! Hello i would very much enjoy playing the beta, I give you “Inmotiongaming” permission to pass my email along to “MAYN Interactive” so i may play the beta. Hello Team, Im a great fan of Counter-Strike and i really want to try that game i give you my permission to give my email to the devloppers thanks a lot ! i give permission to give my email to the game developer, MAYN Interactive. I would love an invite to the closed beta of Tactical Intervention and give permission for my email to be passed on to MAYN Interactive. Loved Counter-strike in general and would probably love this game too. Very interested in giving solid feedback and joining another competetive fps. I want an invite to the Tactical Intervention Closed-Beta and that I give you permission to pass my email address on to the game developer, MAYN Interactive. Sorry for the double, “now tripple post” the site was timing out and i worried my comment had gone through. THANKS AGAIN!!! I give permission to pass my email to MAYN Interactive for the TI Beta. Thank you. I give permission to give my email address to MAYN interactive for their use in perpetuity throughout the universe, really want in on this. I would love a join the Tactical Intervention Closed-Beta. I give you permission to pass my email address on to the game developer, MAYN Interactive. I really want to be in the beta because I am a longtime CS Fan. Also, YES I do GIVE you permission to forward my email to MAYN interactive for the BETA! Huge CS player and super stoked for this game! I would like an invite to Tactical Intervention closed beta and I give my permission to forward my e-mail address to the game developer, MAYN Interactive. i would love ever-so-much to try out Tactical Intervention Closed-Beta and i give my full permission for you to give my email address to the developer! I would like a invite to tactical Intervention and you have my permission to use my email address. I give permission for you to pass my email on to MAYN Interactive for the TI Beta. Thanks alot been waiting for this! I would like an invitation in order to promote the game as well as In motion Gaming with my video updates. I give you full permission to pass my email on to MAYN Interactive. I would like an invite to the Tactical Intervention Closed-Beta and I give you permission to pass on my email address on to the game developer, MAYN Interactive. i want an invite pls. I give you permission to pass my email address on to the game developer, MAYN Interactive. I like CS. I would like an invite to the Closed – Beta and I give permission for you to pass my email address to MAYN. I would love to be part of the Tactical Intervention Beta. I give you permission to pass on my email to the game developer. I have been playing cs 1.6 for over 9 years and would love to continue to a new game with better graphics. EDIT: this might be a copy, I’m not sure. If that is the case then i am dreadfully sorry, I have been anticipating this game for quite some time you see. I would like to receive a closed beta key of the game, because I am a great fan of Shooters, and this mod looks pretty awesome (I have tested a lot of Half-Life 2 mods before)! You may pass my e-mail address to MAYN Interactive ofcourse. If I will receive a closed Beta-key, I’ll try and play it all day! I’m also a great fan of Counter-Strike, by the way. Have been playing CSS and CS 1.6 for some years now. I Hereby give you permission to pass my information(email) on to MAYN Interactive for a beta invite. Motion Gaming permission to pass my email address on to the game developer, MAYN Interactive. I am really excited for this game and would love a beta key! You have my permission to pass along my email address to MAYN Interactive. 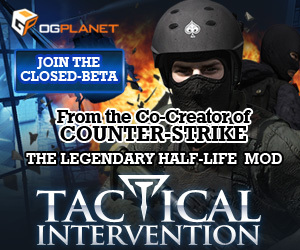 I totally want an invite to the Tactical Intervention Closed-Beta! You have permission to pass my email address on to the game developer, MAYN Interactive. I want an invite. You can pass my email on to them. By moderation, i think they are checking to see who is getting the codes, as mine still says that. Been playing CS for years, can’t wait. I give you permission to pass myemail address on to the game developer, MAYN Interactive. I would love to be part of the close beta for Tactical intervention. I give permission to you to pass my email on to MAYN Interactive for the Tactical Intervention Beta. Thanks and hope I get the opportunity to the test the game. I would really love the chance to be part of the Closed-Beta for Tactical Intervention, and I give you guys permission to forward my email to MAYN Interactive. Since my previous attempt is still under moderation I am going to give it another shot. Lets not have this one be under moderation forever. I met you guys while playing Call of Duty, and thought you guys were fantastic! I saw the invite and would love to play the beta! I would love an invite for CS:TI Beta. I’ve been a fan and would be very grateful! I want an invite to the Tactical Intervention Closed-Beta and I give you permission to pass my email address on to the game developer, MAYN Interactive.Thank you for this opportunity! Could I please get an invite for the Tactical Intervention Closed-Beta. I give permission for you to share my email with the producer of the game, MAYN Interactive. Thank you. I would like an invite to the gaming community, Tactical Intervention Closed-Beta. I give you permission to pass my email to the game developer, MAYN interactive. I want an invite to the Tactical Intervention Closed-Beta and I give inmotiongaming permission to pass my email address on to the game developer, MAYN Interactive. I would love to get an invite to the Tactical Intervention Closed-Beta and I give you permission to pass my email address on to the game developer, MAYN Interactive. I would like to receive an invite to the tactical interventon closed-beta and give you permission to pass my email address on to the developer, MAYN interactive. Would love to play this game. I give you permission to pass my email address on to the developer, MAYN interactive. Would love an invite, pass my email on, please. I would love a beta key! Hi! I’d like an invite to the closed-beta session of Tactical Intervention! I agree to forward my email address to the game developer! Thank you! Please I want to try this game Please! Thank you all for signing up for our Tactical Intervention closed-beta invitations! Regrettably we have to close it down now. At over 300 sign-ups, we are way over our allocated slots. However, we will put our excellent negotiating skills to the test, and try and get everyone who has commented so far into the system. We apologize if you didn’t make it this time, but never fear, as we will be giving away plenty more beta keys, closed-beta invitations, VIP memberships and games regularly. I NEED an invite to the Tactical Intervention Closed-Beta and I give you permission to pass my email address on to the game developer, MAYN Interactive. GIVE ME, GIVE ME, GIVE ME, GIVE ME… plz? I really want an invite to the Tactical Intervention Closed-Beta and I give you permission to pass my email address on to MAYN Interactive. Thanks for the chance guys huge fan of CS!! I would LOVE an invite to the TI Beta, and i Give you permission to pass my email address on to the game dev. MAYN interactive. I would like an invite to the Tactical Intervention Closed-Beta and I give you permission to pass your email address on to the game developer, MAYN Interactive. I would love to get into this beta! You can pass my email to MAYN interactive. It would be a pleasure to be invited to play the TI beta. I give you my permission to pass my email to MAYN Interactive. I analyse TI with 5000 words to help out. I have multiple PCs and I just bought a very good one. I can help out with compatibility, etc.